The Makita co-operation Japan, makers of professional power tools, bring to you yet another range of rough and tough gear, Makita circular saws. These saws are packed with power and convenience, while also bearing some cons. Buyers usually choose circular saws that feel comfortable, have a well positioned handle, bevel cuts and how light in weight it is et al. Makita Saws are known for their convenience, blade capacity, ample power and accuracy. Here are some of the common types of Makita Circular saws with their dash of pros and cons. Makita saws bring to you the best of both worlds, power and convenience of a cordless. Some common features demonstrated by Makita cordless saws are light in weight, comfortable use, precision, compact design convenient for a range of cutting applications and the motor delivers great power for faster cutting through wood. The downsides: Some cons which users have experienced are the 1.5 Ah batteries do not fit all the other Makita circular saws and do not last long; also some of them feel cheap. Some users have experienced poor quality base and meter guide with some of the Makita circular cordless saw which is a specific18 Volt LXT. From the assortment of Makita Saws, come the hypoid saws which are tough enough for rough use and small enough for precise work. An ideal tool for home renovations and framers, it delivers deep bevel cutting capacity. The disadvantages some experience is that the tool is in poor condition when delivered with dust covered casing. Some Makita Saws commonly promoted and seen online are: A Makita 18 Volt cordless 6 ½ Inch saw comes with a power brake for much safer use than other circular saws. Furthermore, the saw also consists of features such as built-in L.E.D. light to illuminate the work area, a dust blower that keeps the line where you cut free of debris. However, reviews from users indicate that one has to make sure, that this one always has a sharp blade while working. A range of Makita saws with 14.4 Volt packs Ni-MH battery for longer run time. They also feature easily changeable blades with the help of shaft locks and adjustable cutting depth. Bevels up to 45-degrees, which is great for a small light in weight saw. 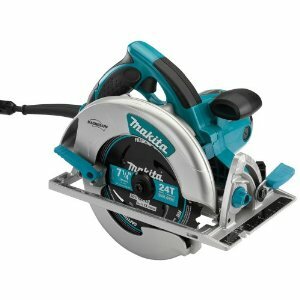 A line of Makita 7 ¼ Inch saw delivers great power and with the magnesium it is light in weight. Also contains reinforced power cords, built-in fan and sealed gear housing to ensure high-performance oil surface coating. Makita circular saws with 15 amps are long lasting, safe and high in power. Some users say that the saw is a bit fragile on the side, yet packs power that works for just about anything. Makita Circular Saws with 16 5/16 Inch saw blade are powerful to cut through 6x stock with ease, saving time and effort. Some drawbacks which users are talking about are the plate is narrow and the placing of the safety switch. It is a bit uncomfortable to reach the safety button. Choices to choose from are ample, with reviews being both brilliant and bad, but your choice does depend on your budget and need. However, be it for renovating your home or professional heavy work carpentry Makita saws do get the job done. Return From Makita Circular Saws Page to Home - Finishcarpentryhelp.com.